File photo of SCP-ES-029 after sterilization. A non-mechanical long-exposure device must be used to capture the photograph, due to SCP-217-ESM. Special Containment Procedures: Due to the proximity of Bio-Containment Site-029 to the mainland, the island should only be accessed by sea. Any water or air transport within a 3 km radius of SCP-ES-029-1 is to be diverted under the cover of military exercises in the area. Shooting down any vehicle that ignores withdrawal orders from the Site is authorized. A weekly review of all the local flora and fauna is to be performed. An STM217 tracking/inoculation device is to be installed in some lower limb of birds' body to monitor and evaluate vital signs. In case of signs that illustrate possible infection, the device must be activated immediately, neutralizing the infection and eliminating the bird in the process. A specialized niche has been created for migratory birds on the south side of the island, open during the summer and winter seasons. All forms of plant life that present the same signs must be incinerated. All mechanical equipment that presents interferences, electrical faults or anomalous operation should be sprayed with the agent VLG-LAMBDA and subsequently discarded. The area around 029-F is contained within a reinforced concrete dome 15 m in diameter, in a unit attached to the Site. Inside, five SF5-KAFSTIKOS modules will sprinkle agent ZEER-217-45 "Versus Mechanicus" once every 48 hours. In order to avoid any adverse effects to instruments and equipment, access to the dome will not be allowed during the activation of the SF5-KAFSTIKOS. If this is not the case, all subjects inside the dome should, as far as possible, not use metal composite instruments or cover them with a thick layer of HDPE, thus avoiding their disablement. The mining areas have been sealed, and seven SF5-KAFSTIKOS units have been stationed around the entrance, operating 24 hours a day. Any approach is prohibited after the point defined by the SF5 units installed there, except under repair or replacement of defective modules. Description: SCP-ES-029 is the collective designation of the inhabitants of the sterilized city of Coronel Videla (located in 55°1█′ S, 66°5█′ W), near Lennox island, Chile (designated SCP-ES-029-1), inhabited by approximately one thousand people in 1996 according to census records, where a sudden increase in population density was carried out over a period of approximately 10 years as a result of the arrival and subsequent installation of a splinter of GoI-004-B (re: Church of the Broken God - Cogwork Orthodox Church) at the end of that year. Due to the inherent isolation of the city, geographic features in the surroundings and the local climate, the activities of the Church of the Broken God managed to go unnoticed during the whole period from its arrival until its discovery by the Foundation, during the consolidation of the Site-███ for the containment of [REDACTED] in mid-2006. The first records that were archived about SCP-ES-029-1 revealed that it was an isolated rural city, whose inhabitants lived in a self-sustained way, although in conditions quite inferior to those of the administrative region of which they were part. One of the distinguishing features of SCP-ES-029-1 was the absence of electronic instruments. The inhabitants did not have electric light, nor were they connected to the energy matrix, so much of the lighting was provided by oil lamps, candles or torches; consequently, they did not own telephones, computers or television. Regarding food, the population consumed only what it produced, and the shortage of people, coupled with long days of agricultural and livestock work and the need to perform each task manually, forced a large part of the population to actively work in this area, including children, who could not procure education, due to the absence of teachers and schools. The absence of hospitals or medical centers, beyond an herbalist and popular wisdom, made the diseases very difficult to treat in SCP-ES-029-1, which had very high rates of morbidity (sometimes reaching 96%). This particularly affected those who suffered fractures or bone and / or muscle damage resulting from agricultural work, leaving untreated. 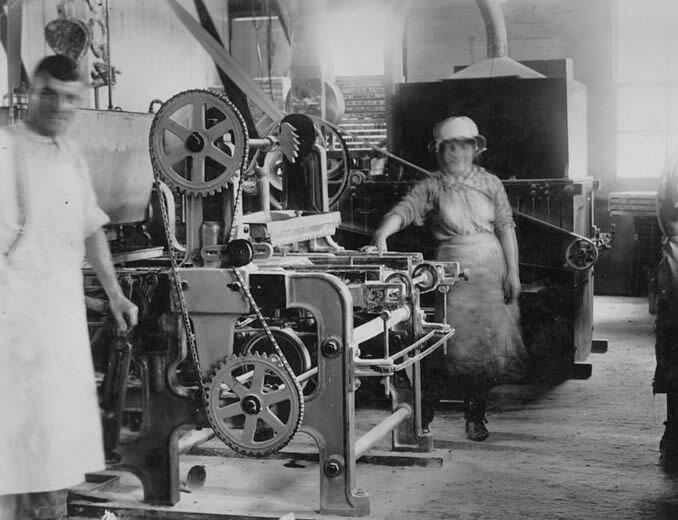 The individuals weakened and incapacitated slowly, but continued to work despite the ailments, in order to avoid a reduction in food production, which in many cases meant premature death. In this way, the population, despite having a high birth rate (approximately 8 children per family), kept their numbers relatively stable. Life expectancy in SCP-ES-029-1 was 39 years. Although the exact moment of the arrival of the Church of the Broken God to SCP-ES-029-1 is unknown, it is theorized that its members may have run aground on the coast 26 km south, presumably escaping from an invasion of their settlements in the Islands. Falkland product of the manifestation and proliferation of Proto-Sarkic cults originating in Argentina. This hypothesis is supported by the rapid contrast between the presence of the work in both the Falkland Islands and the southern area of Rio Grande, declining rapidly in the Sarkic presence after three months. The offshoot of GoI-004-B (called SCP-ES-029-2) had fourteen surviving members at the time of arriving at SCP-ES-029-1, in mid-1996. The recognition of the city made them realize the absence of technology, reason why they considered it apt to replenish their operations, taking advantage of their relative isolation. They built a three-story, almost 430 m² building near the residential area (called SCP-ES-029-R) that they would later use to expand their creed, paying attention to the activities and needs of the population. SCP-ES-029-R stood out over the other buildings in the area, both for its design and Victorian architecture, completely different to the vast majority of local buildings, made of wood. The building did not have a liturgical aspect, rather it resembled an old factory, which served as a hospital. One of the members of SCP-ES-029-2, the Faithful Fabricator Lucas M. Gattini, (Supervisor of Inventions and Schemes) launched a project to "recompose the lost children of MEKHANE at the end of the world". From SCP-ES-029-R, the Church attended to the entire population of SCP-ES-029-1 free of charge, carrying out reconstructive surgeries and replacement of limbs considered inoperable with retro-mechanical similes, acting as limbs. bionics or fixations, but whose composition consisted mostly of an unknown alloy resembling bronze. Due to containment procedures, it has been impossible to perform detailed tests on this material (See Project Report 029-OXIDE for more details). They also administered doses of a drug referred to as "Episkevastin", derived from a synthesis of silver ingots and other minerals, some fungi including Penicillium crysogenum, and treated with a modified strain of SCP-217 (called SCP-217-ESM) by an unknown process (See Volume 11.21.E-8: Of the Gestalt Reconfiguration As Mediator for Infamy of the extracts retrieved from the Scheme of the Patriarchs for more details). One of the production lines of the agent SCP-217-ESM, on the second floor of SCP-ES-029-R.
Sedation: The patients were impregnated with a powerful olfactory sedative, which generated an obnubilator effect and also served to block the nociception of the organism. As a result, patients were not aware of the following processes, which they could only remember as "a walk through a mechanized city". In addition, the sedative significantly reduced the level of psychic resistance of the patients, making them totally influenceable. Preaching: Once the whole group was sedated, the members of 029-2 proceeded to turn on several gear mechanisms that only served to make noise, and went to a resonating chamber located in the center of the first floor. There, they performed chants that, by means of a system of pipes, could be heard in all 029-R. This was useful to "convert" the patients into members of the Cogwork Orthodoxy. This lecture lasted until the end of the process. Reconfiguration: When patients reached the third floor, they were taken to several secondary transport belts, depending on their body conditions. 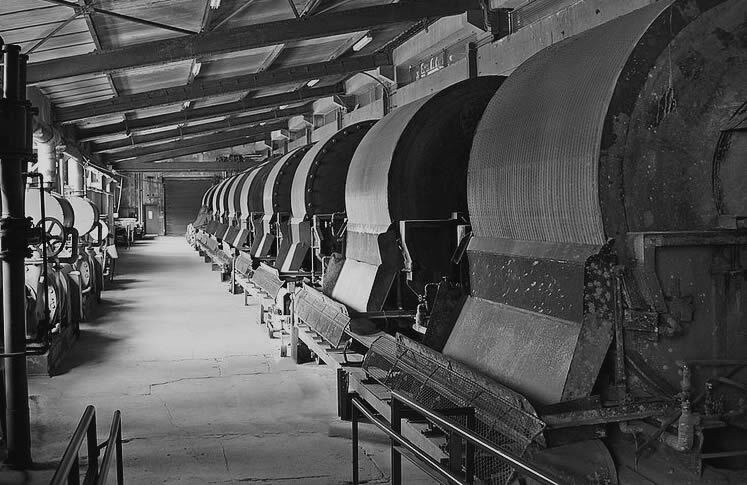 Each belt had an associated machine that replaced damaged body parts with metal equivalents. Often, patients were returned to the beginning of the circuit and taken to another tape, where they were reconstructed by other machines. Once they were "healed", they were taken by a last tape to a "cubicle", from which they descended to the first floor. Immunization: Within the cubicle, patients were "sprinkled" with Episkevastine loaded in SCP-217-ESM, which unlike the normal strain, its infestation time and biochemical conversion only took an average of 20 days. In addition, this strain was able to manipulate the body's immune system, controlling it and converting the body's cells into small nanomachines, capable of leaving the body in the form of an "aerosol" and thus counteracting any invasive pathogen very effectively. However, this strain can only operate properly if the host has at least one mechanical graft in its body, necessary to "lodge" and convert the body quickly. Otherwise, the strain will react erratically and quickly destroy the organism, preventing it from entering symbiosis with the body. The process lasted 8 hours, and was usually completed before dawn. The patients were then taken to their homes, where they returned to their normal lives, but these also served to make known the schemes and plans of the Church for the city, and spread the faith of the Cogwork Orthodoxy among the population. This had the advantage of minimizing any reaction opposed to the dogmas of the Broken God, and ensured that the entire population would be converted and incorporated into the Orthodox Church eventually. When there were no longer any sick people left, it was normal for those "converted" to purposely cripple their family and friends, usually covertly, in order for them to be picked up by members of SCP-ES-029-2 and "cured". This measure was planned by the Church itself to ensure that all citizens were "reconfigured," allowing SCP-217-ESM to function properly. After about a year, the entire population had been "treated" and successfully converted. The city had a central building not consistent with the basal architecture. (SCP-ES-029-R). There was a constant mist surrounding the inhabited areas, making observation difficult, following patterns that differed from the winds. 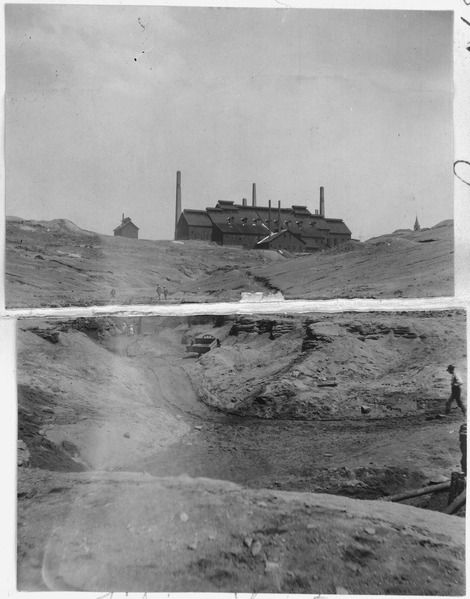 The agricultural works had been completely abandoned, being replaced by a great mining activity. The inhabitants were totally unprotected. The compasses pointed to SCP-ES-029-R if they were within 10 km of each other. Every instrument receiving radio signals received a high level of interference, inconsistent with normal operation. Every electronic instrument saw its effectiveness diminished to less than 7 km of SCP-ES-029-R. The team of investigators requested authorization from the O5 Council to deploy Response Teams in the area in order to determine the nature of the city. It was thought at the time that SCP-ES-029-R was a radio-inhibitor and that the city could be under the control of the Chaos Insurgency, considering the observed activities of the inhabitants. MTF ψ-11 ("Finis Orbis") and σ-25 ("Groovy Kids") were deployed on the east coast of SCP-ES-029-1, in order to collect zone data, deactivate the inhibitor and eliminate any confirmed resistance from the Insurgency. Transcript of a recovered recording of P. ██████, a member of MTF σ-25 ("Grovvy Kids"), specialists in detection, incursion and work on electromagnetic anomalies. It should be noted that P. ██████ was the only survivor of the incursion of SCP-ES-029. Specialized video equipment was used for electrically unstable environments, but due to this it was impossible to transmit in real time. 0:00:00 - Start of recording. P. ██████ leaves the motorboat with his equipment, securing a perimeter on the coast. A member of σ-25 tries to contact the HQ, as agreed. The communication does not work: the radio only emits white noise. 0:03:12 - Arrival of MTF ψ-11 at the security perimeter. Deployment of two reconnaissance drones around the area, with the aim of discovering possible attackers at stationary points..
0:04:36 - The drones become inoperative 700 m from SCP-ES-029-R. The building is identified as the source of the interference. Both MTFs begin to approach the residential area of SCP-ES-029-1. 0:11:29 - 900 m from SCP-ES-029-R. Three humanoid figures in sight. A closer inspection shows roughly mechanical features on their faces and upper limbs. When observed, they retract in the direction of SCP-ES-029-R.
0:16:37 - Video feed is slightly interrupted. The team encounters a large number of barriers on the roads leading to SCP-ES-029-R. It is necessary to break through these barriers by bursting through the houses. There are no signs of life in any of them. 0:25:40 - MTF σ-25 goes inside SCP-ES-029-R. Video feed is interrupted intermittently. There is no inhibitor in the zone. The interior of the building resembles a 19th century distiller. One of the members of σ-25 starts coughing. It is worth noting that there are no stairs or other means to climb the other floors. 0:28:11 - Two humanoid figures are found lying on the ground near a conveyor belt. This belt is tilted at an angle of 30° upwards at the end of a lightly lit tunnel. A member of the team approaches the belt, and it is sprayed with an unknown chemical halfway through. He then falls, being carried by the belt. Two members try to help him. P. ██████ observes the bodies: they present almost 75% biomechanical conversion product of SCP-217-ESM. Photographs are taken with isolated cameras. 0:33:02 - Sound of gunshots heading south. MTF ψ-11 is engaging a group of humanoids showing similar characteristics to the bodies found. σ-25 assists. P. ██████ carries out suppression fire to allow their team to find coverage. An amplified voice (L. Gattini) is heard starting a sermon, apparently speaking from the third floor of SCP-ES-029-R. His speech is consistent with CotBG's rhetoric. 0:39:51 - MTFs retract 150 m to SCP-ES-029-R E. P. ██████ looks north, from where a large number of humanoids infected with SCP-217-ESM, estimated at three thousand, are observed, heading toward their position. The effects of interference seem to be increasing from this moment on. 0:46:22 - MTF ψ-11 withdraws, while P. ██████ and two other members of σ-25 return to SCP-ES-029-R. There they find the three members leaving the tape, one of them unconscious. They quickly retreat through the houses as gunshots are heard. Sounds do not match standard weaponry. L. Gattini gives a direct order to engage Foundation personnel from his position. 0:52:33 - Regrouping of the two MTFs at approx. 500 m from the security perimeter. More shots are heard. One of the members of ψ-11 (H. ███) is hit by projectiles. When they are removed from their body, it is evident that they follow a conical pattern. MTFs quickly retreat to the coast. 1:01:25 - The team σ-25 arrives at the perimeter, but finds only one motorboat on the coast. It is presumed that the others were shot down, as they were not found in the vicinity. H. ███ collapses. More gunshots are heard. ψ-11 responds to the fire, ordering σ-25 to board the motorboat. 1:04:51 - σ-25 boards the motorboat, but it seems to be stuck. Two members descend and try to push it into the water. A small group of humanoids are killed by MTF ψ-11 as they attempt to break into the security perimeter. Two casualties are counted at ψ-11, as more humanoids continue to arrive in the area. 1:06:22 - The motorboat leaves, but the two members of σ-25 are not able to climb. As they move away from the coast, a thousand humanoids are observed surrounding the subjects and the entire DM ψ-11. A bolt hits a member of σ-25 near the trachea, dying shortly thereafter. With the exception of P. ██████, the entire σ-25 team presented chronic lethargy and persistent internal pain, in addition to emitting clicks and sounds similar to an analog clock, symptoms consistent with SCP-217 infection. Affected subjects were administered the modified agent ZEER-217-25, which destroyed the pathogen SCP-217-ESM, but the incomplete conversion of subjects caused a gradual decrease in brain activity, causing various psychological disorders, including Body Integrity Identity Disorder. Five hours later, all affected subjects had perpetrated amputation of their limbs not subjected to biomechanical conversion. Their causes of death were attributed to severe hemorrhages. Both MTF ψ-11 ("Finis Orbis") and σ-25 ("Groovy Kids") were bestowed with the Purple Heart for their actions in SCP-ES-029-1. Only photographic record recovered from operations at SCP-ES-029-R during Project 217-OXIDE, apparently taken by L. Gattini. Project Lead: Dr. C. Ramírez, Site-███ Head Researcher. Project Team: Dr. ██████, Dr. ████, Researchers ██████, ████████ y R. █████, Mobile Task Force ψ-12 Leader ("Iron Apostates"), formed after the extinct ψ-11. Summary: Development of an effective procedure for the eradication of SCP-ES-029-2 and its effects on SCP-ES-029-1, ending with the activities of the Church of the Broken God in Tierra del Fuego. Briefing: Laboratory analyses have shown that the SCP-217-ESM strain has a much higher resistance to those observed in the normal [SCP-217 strain. Notable characteristics of SCP-217-ESM include resistance to temperatures between -70°C and 600°C, a considerable reduction in its incubation and infestation time, immunity to the chemical agent ZEER-217-11 (effective against the normal strain), and subsequently to the modified agent ZEER-217-25. However, the most notable characteristic is its ability to infect also plants and fungi, as well as the ability to "control" electrical or mechanical equipment that is composed of metal alloys. In addition, both plants and equipment will "spray" SCP-217-ESM to any uncontaminated organism or equipment. Because of this, any approach to the area, or any field measurement, is impossible. Images from the KTM-LO-71 observation system (Southern Cone Zone of Interest) have allowed more detailed monitoring of SCP-ES-029 operations. Every 3 days, the entire population gathers in 029-R to gradually expand its infrastructure, while activities that resemble an amalgam between liturgical ceremonies, meditation and paramilitary training using anomalous weaponry are carried out. On the rest of the days, mining operations are carried out, mainly extracting iron ore and coal. Modified chemical agent ZEER-217-47 "Versus Mechanicus", a more powerful version of ZEER-217-25 to counteract the proliferation of SCP-217-ESM. Broad-spectrum oxidizing agent VLG-LAMBDA to erode all exposed metallic material, to decrease the virulence of SCP-217-ESM. Once the zone is neutralized, MTF ψ-12 should be sent to, equipped with protective HG-15 suits treated with 217-47 agent, and should evaluate the situation in the area. All hostile targets must be eliminated. Civilians still alive should be retained re: possible cure/treatment against SCP-217-ESM, since the application of agent ZEER-217-47 could produce adverse effects in its direct application by air. Progress: One day before the Communion Event, a SCALP-E2 cruise missile was launched from [REDACTED] in the direction of SCP-ES-029-R, striking at 0843 the next day, just as SCP-ES-029 was concentrated in the building. In time-synchrony, 15 minutes later, it struck a second missile, launched from the Site-███, loaded with the ZEER-217-47 "Versus Mechanicus" counter-agent. The satellite images revealed a large number of people, along with L. Gattini and his subjects, taking refuge in a wooden structure adjacent to 029-R (029-F), presumably due to the systematic failure of all mechanical devices in the area. Several people failed to protect themselves from the EMP, falling incapacitated where they were. At 0900, two F-15E Strike Eagle bombarded the entire 029-R zone with modified bombs with the VLG-LAMBDA agent. The harsh weather conditions dissipated the application of the agent by 20% in Ground Zero, but after 50 minutes, almost the entire structure of 029-R showed signs of corrosion on its surface. 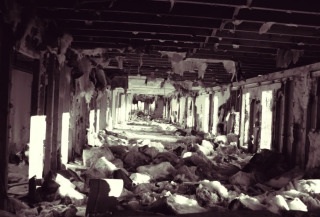 The collateral structural instability produced a collapse of the roof, making visible the interior of the third floor of the building, discovering five of the original serfs of SCP-ES-029-2 convulsing on the floor. Mobile Task Force ψ-12 burst in at 0945, deploying immediately towards 029-R. Upon arrival, no hostile resistance was encountered, however, electronic instruments could not yet be operated. Photographs taken from isolated devices presented interferences that made documentation impossible. In a raid on 029-F, roughly four thousand people were found scattered on the ground, with their bodies almost entirely mechanical, eroded and immobile on the ground. Their "decay" process consisted of a rapid degradation of their components, resulting in scattered, rusty and malformed pieces of machinery within an hour. The density of SCP-217-ESM inside the area was very high, however, due to the construction material of 029-F, the virus strain was relatively contained. All exits from the structure were sealed. Subsequently, MTF ψ-12 meets L. Gattini, being partially affected by SCP-217-ESM, slowly heading towards the squadron. He does not respond to the arrest warrants of R. █████. L. Gattini then proceeds to throw a ripe fruit of Malus domestica (Common Apple) affected by SCP-217-ESM, detonating when it falls, and sprinkling an unknown caustic liquid. L. Gattini is then shot down by the team. Two casualties and two wounded are counted in MTF ψ-12. Quickly, five SF5-KAFSTIKOS units are deployed to programmatically sprinkle ZEER-217-47 agent, keeping all SCP-217-ESM sprouts at bay. From the coast, a patrolman uses a flamethrower with modified napalm to burn all plant life with traces of contamination. After sanitization of the area, Bio-Containment Site-029 was installed. Explorations were made in the mining areas in search of survivors. See Exploration Record 029 for details. 20 days later, the area has been secured. 029-R has been demolished, building adjacent Area-029 as the MTF ψ-12 headquarters. SCP-217-ESM has been successfully contained and placed in a controlled environment. 029-F isolated and monitored for remains of SCP-217-ESM. SCP-ES-029-F. Below, the vast majority of bodies lie corroded and undone in the rubble. Taken during the establishment of the Containment Protocols. What was carried out here is but one example of what could happen if groups like the Church of the Broken God were given enough time and distance to carry out complex operations in isolated regions. Who knows how many cells are active out there, silent, hidden among mountains and bodies of water, converting people and preparing to take more direct action against us. If we had discovered SCP-ES-029 a year later, a month later, or even a week later, these events could have escalated to unstoppable heights. The Church of the Broken God has no scruples in using innocent people to carry out their schemes, no matter what branch they are. And because of this, an entire city has had to perish. Nothing is more regrettable than collateral damage, especially if it is human life. We could do nothing to save them, but we stopped whatever planned this offspring of the Cogwork Orthodox. Unfortunately, although our task was accomplished, a part of the population, part of human history, has fallen into oblivion. Most regrettably, nothing we do is going to change that. We cannot bury these men, women and children. The only consolation that remains is that we prevented their lives from being used against their will for the machinations of a few.